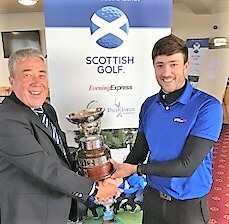 Adam Dunton (McDonald Ellon), showing no signs of tiredness after winning at the 25th hole against leading qualifier Barrie Edmond (Bon Accord) in the morning semi-finals, won the North-east District match-play championship for the Jaffrey Cup with a 4 and 3 win over Chris Gilbert (Cruden Bay) in the afternoon final at Peterhead Golf Club. In the final, played in pouring rain for the first four holes Chris and Adam had seven birdies between them. A lost ball and another out of bounds cost Gilbert dearly. Dunton and Edmond were both one under par for the 25 holes of their morning match. Adam Dunton (McDonald Ellon) bt Barrie Edmond (Bon Accord) at 25th. Chris Gilbert (Cruden Bay) bt Corin Stewart (Murcar Links) 2 and 1. Dunton bt Gilbert 4 and 3.